Folks, it was a while in the making, but we did it. The release titled Mending Time includes 13 tunes. Mending Time features the fine contributions of many very special guests including Erin and Randall from the Ragbirds, Peter Madcat Ruth, Jo Serrapere, Brian Delaney, Chris McCall, Rochelle Clark, and Jason Dennie. One track is even a co-write with our old pal the Grammy Award winning Tim Fagan. Mending Time is available at Dave’s gigs as well as iTunes. “It hasn’t been an easy year for the nicest guy on the local music scene. 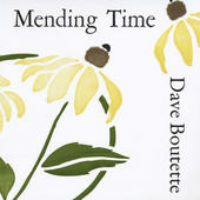 But true to his nature, Dave Boutette has taken a troubled time and mined it for the material that forms the backbone of his new record, the appropriately titled Mending Time. 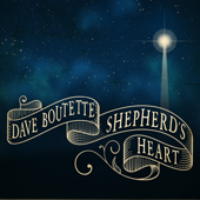 Fortunately, Boutette is too good a songwriter, and too unfailingly upbeat, to lather an entire album in pathos and lament. 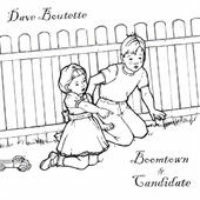 Instead, for his fifth and probably—no, definitely—his best album, Boutette has crafted a record that mixes the personal with bigger-picture themes to create a cohesive and delightful collection of breezy songs. Hard times have never sounded so good. Boutette is reluctant to discuss the particulars of the past year or so, other than to say they involve endings and new beginnings and coming to terms with both. It isn’t until you really dig into the songs that their true heft becomes apparent. 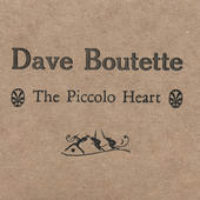 As he has in the past, Boutette teamed up with the Dexter-based producer Adam Druckman to set the tone for Mending Time. The pair found the perfect sonic settings for Boutette’s deceptively intricate tunes. 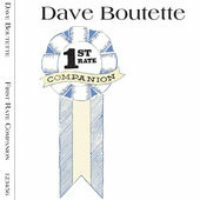 outette teamed up with the Dexter-based producer Adam Druckman to set the tone for Mending Time. The pair found the perfect sonic settings for Boutette’s deceptively intricate tunes.